The Oculus Connect 2 event that happened today had a lot of interesting and even breathtaking announcements. One of the more fascinating pronouncements of the day was that they’re going to partner with several different video streaming services to allow you to watch content in VR. Netflix, Vimeo, Hulu, Tivo, Twitch and more are partnering for VR video experiences. 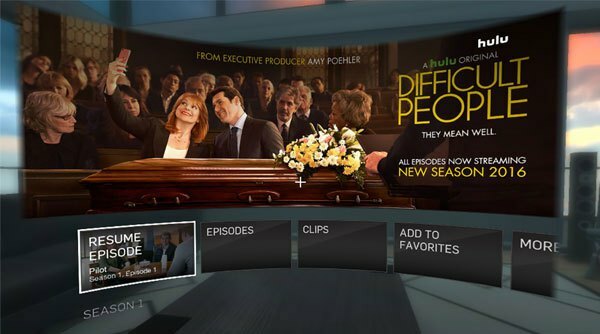 Some very prominent video streaming services are set to provide support for VR, developing apps that let you experience the video on a more personal level. 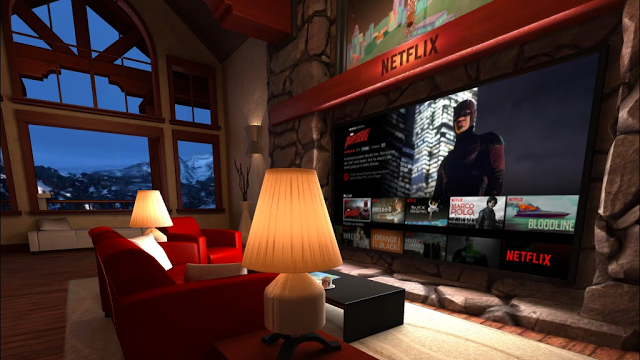 Netflix should have an app that’s available now for Gear VR that gives you a personal viewing experience complete with a pointer that follows your gaze. 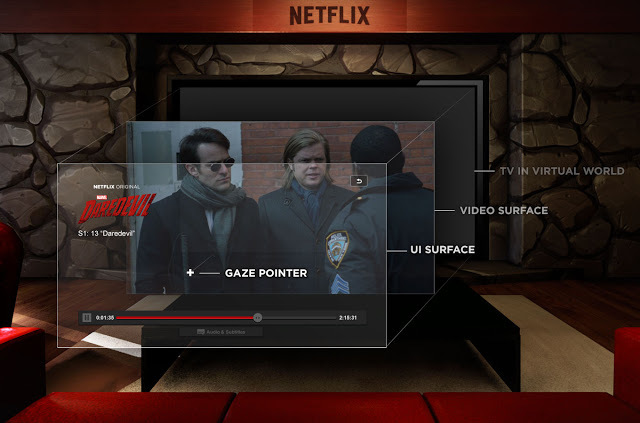 The Netflix app is limited to 720×480 in resolution on Gear VR, however, due to the need to execute in a protected environment, which limits the interaction possible with the GPU or the CPU. When decoding video, the video stream is put into a protected buffer that can’t be accessed by anything else but the screen, thereby completely limiting how the device can interact with video. This poses a problem with creating virtual environments because ultimately the video stream would have to be seen as a texture in and of itself to be applied to a virtual background. While on the PC it’s possible to create a virtual theater environment that can be separately rendered by the GPU. Problems were found in having higher resolutions and needing to apply mip-maps or even environmental lighting, it just wasn’t possible in the way that Netflix wanted it. But with some great pixel blending, it might actually end up working well. The other more fascinating entry was that of Twitch. 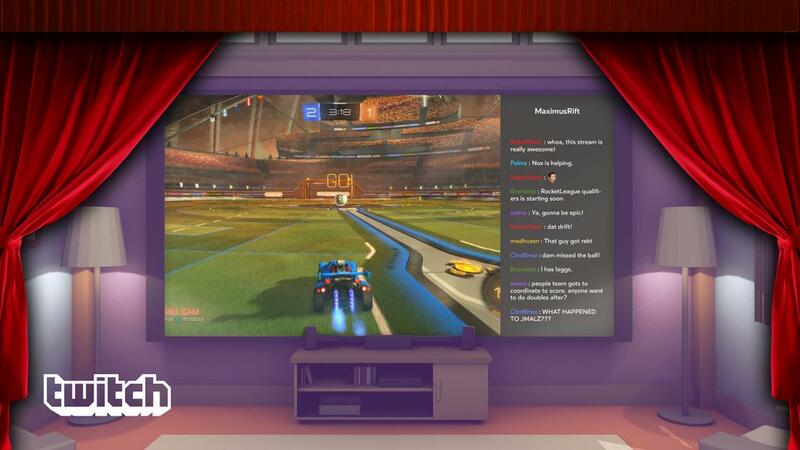 Being able to watch game streams and even interact with those streams via your Gear VR or even Oculus Rift. I’m not sure that there would be much difference in having your own room in the background as opposed to simply watching a screen that’s a bit closer to your face. Unless there are novel features not available in the desktop, or mobile, app alone, it doesn’t seem of much utility. Also making a showing are other big names like 20th Century Fox, Hulu, Vimeo, Lionsgate, Facebook and even Tivo. All of their apps will be coming in the future with no actual release date planned. It’ll be interesting to see how this exactly works and this reminds of being “plugged in” in much the same way seen in a historic South Park episode. Quite honestly, watching non-optimized for VR video doesn’t seem very compelling compared to simply watching on a TV. Certainly not while the screen door effect and even motion sickness can be a potent problem. It just doesn’t seem useful at the moment, though that can change with the addition of features that differentiate this from normal video viewing.